A “too” simple view of marketing? Preferred format: This teaching activity can be run in small groups or as an in-class discussion. 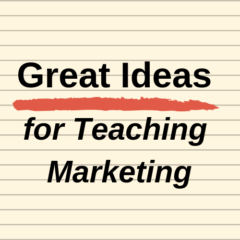 Student audience: This discussion exercise is designed for introductory marketing students. Exercise time: This activity will take around 10 minutes, perhaps longer as an in-class discussion. Notes: There are several other discussion activities on this site for defining marketing. There are 100’s of definitions of marketing available on the internet and even different marketing textbooks use different variations of what marketing is all about. And even in the business world, you will find that different firms and even different managers have a somewhat unique view of the role of marketing. As you probably know already, the key goals of marketing are to generate long-term profits, deliver customer satisfaction, and improve the competitive strengths of the organization over time. In other words – GET – BUILD – HOLD customers. Clearly there is a whole array of marketing strategies and tactics that are built by the firm to deliver these three goals for the organization. Do you agree that the goals of marketing can be simplified down to just three words (that is, get, build, hold)? Why, why not? Outside of these customer goals, does marketing have any other purpose? Please outline your thoughts. How would you define marketing in simple terms for a non-business person? Next Next post: Is marketing for me?